New Hampshire troopers responded to a report of a motor vehicle rollover early Sunday morning in Madbury. 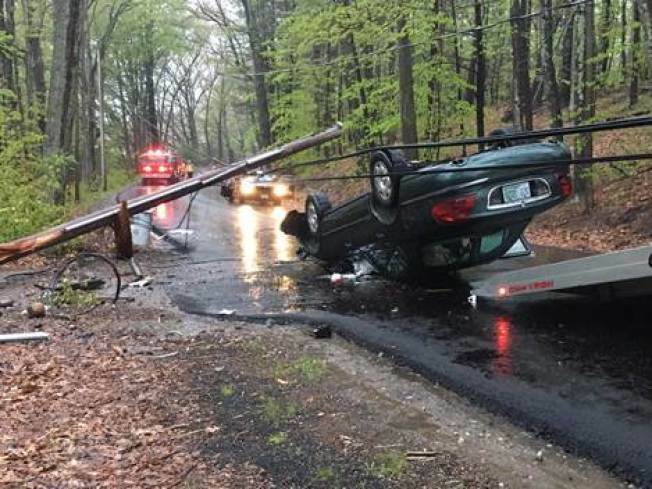 They found a car rolled over by 43 Pudding Hill Road, entangled in electrical wires by a snapped telephone pole hanging across the road. Driver Brendan McKenna, 20, was arrested for driving under the influence, and did not sustain any serious injuries as a result of the crash. As a result of the damaged pole, part of Pudding Hill Road was shut down for hours, leaving area homes temporarily without power.